Last week featured a special treat. Two colleagues from my former workplace picked me up for lunch with my former boss and another colleague. This was also my first visit to Lulu’s Corner Café in downtown Ocean Springs. The list is long on why this new eatery and coffee shop made lunch a memorable and festive event. No. 1 on the list was catching up with these special folks. I miss the creative energy that these individuals brought to the projects we worked on together. I love having people around me who are better in areas that I appreciate but don’t excel in, and working with these individuals was an adventure. - A funky festive atmosphere livened up the old cottage that is home to Lulu’s. The structure is a part of our town’s early days and still stands thanks to creative repurposing from residence to commercial property. - Metal sculpture roosters and fanciful art gave the establishment an authentic vibe in keeping with the thriving Ocean Springs arts community. - One of the town’s famous roosters visited the back porch where we were seated. More about these feathered Ocean Springs residents here. I thought I saw a second one behind some shrubbery, but he didn’t approach the porch, so I am not certain there was any type of fowl there at all. I am usually not a fan of roosters due to a childhood encounter, a story for another post. This rooster was definitely an exception. He strutted about like royalty. He was a beauty with striking white and black feathers in a symmetrical pattern. I had no luck finding his breed on the Internet. 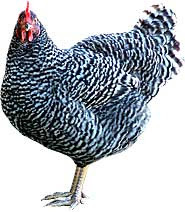 The closest I came was the photo below of a Barred Plymouth Rock. I borrowed it from Breeds section of The Poultry Project blog. The chicken above is a hen, I think. Our kingly visitor sported more white than the one above and was extra long on the wow! factor. We obeyed the don’t-feed-the-roosters sign, and he sniffed disdainfully and left. I am not sure if chickens sniff, but it was all a ploy anyway to blackmail us into feeding him because he eventually came back to try again. When we didn’t oblige with his favored bran muffin, he departed for a more lucrative venue. -The young lady who took our orders was super patient with my new dietary requirement of low sodium. I ordered a salad sans anything with salt in it. I also asked if she could just splash a couple tablespoons of any kind of vinegar and a little less than one tablespoon of extra virgin olive oil on it. One of the things I have learned since this doctor-ordered change is that salad dressings are astronomically high in the salt department. The helpful waitress mixed me up some oil and apple cider vinegar. With the toasted pecans that came on the salad (toasted with sugar, not salt) and the tasty fresh greens and other veggies, I had a scrumptious no-salt meal. I was surprised that I had something that tasted so wonderful and distinctive with no salt. Hubby Walter has been creating tasty low- to no-salt meals at home, but I have been avoiding eating out because everything is usually so heavy in salt. This experience gave me hope that the occasional meal out is in our future. - There was a noticeably relaxed atmosphere at LuLu’s that was infectious. Patrons were sitting at small tables on the front porch, in the tiny inside seating area and on the back porch, some with their newspapers or novels, others busy visiting. It was great! The only downside was I suffered a bad case of operator error with my little point and shoot, so no photos to share. Heavy sigh! Sounds like a wonderful, festive, and rather oddball time (with the rooster). I am so hooked on salt, but it is in EVERYTHING!! I am glad you found something that tastes pretty good without any salt. Salads are pretty palatable without salt, but Phil salts his heavily. He is the only person I have ever seen salt his salads! i am really happy for you and your outing with friends. Lulu's sounds like a place i would love to visit. i love old houses and food. we are doing the low salt thing and i had no idea how much salt is in canned and prepared foods, when i started reading the contents, i realized we were eating a weeks worth of salt in one day, every day. the salad sounds good to me. forgot the rooster. I do not love roosters and stay far away from them, we had a rooster visit our front yard last year and everyone wanted to know why i did not get a photo. it is because they terrify me, roosters and turkeys, i was attacked by one of each at age 8, so no love for them from me. Aw phoo on the camera failure but your description is great. I love chickens and delight in a rooster's boastful noise. Thank goodness my neighbor has some. That place sounds delightful and I am impressed with your sticking to no salt. I once went months with no salt and when I did go back--dummy me--that stuff gave my mouth blisters. Friends can be such a blessing and a battery charger. I'm so happy you could get out and enjoy some time with them. That restaurant sounds like my type of place. Have a wonderful Lord's Day Linda. Your outing sounds like so much fun! I would've gotten in trouble for feeding the rooster...Ha Ha I love chickens--always have. Even those feisty roosters. I'm not sure you followed my blog back in the day of my "chicken stories". Ed and I have some great stories--from me shooting at a raccoon in the middle of one night, to Ed sewing up a hen's neck after she was attacked by a predator!